Today's live action Sengoku Basara review is a little different to the usual stage plays: it's for Takarazuka's unique musical adaptation of the series complete with an all-female cast! Musical Roman 'Sengoku Basara' -Sanada Yukimura-hen- was performed by the Takarazuka Revue's Hanagumi between 15th June and 1st July 2013 at Shibuya's Tokyu Theatre Orb. It attracted an enormous amount of media attention and unsurprisingly, the tickets sold out swiftly. Takarazuka fans and Sengoku Basara fans alike were eager to see this unusual collaboration for themselves. A DVD recording of the 27th June performance eventually followed on 17th September 2013. Priced at ¥8,400, the DVD can be purchased from Amazon Japan, CD Japan, Rakuten, Takurazuka-an, the TCA Online Shop, e-Capcom and Yesasia. I can confirm that the disc is region-free and has a run time of 156 minutes. The pack also contains a survey card, a set of DVD instructions (with a photograph of Yukimura dressed in Takeda Shingen's armour on the back) and a full-colour booklet with information about the songs, chapters and the extended cast. There's also an enormous cast of actresses playing the parts of soldiers, townspeople and backing dancers. My main review is below and it includes some spoilers for the content of the play written from memory. I've included a few more spoilers than usual because English-language information on this show is so scarce. As the title and cast list imply, the plot of Musical Roman 'Sengoku Basara' -Sanada Yukimura-hen- revolves around Yukimura and the two forces he's most closely linked to: the Takeda and the Uesugi. Usami Sadamitsu joins Naoe Kanetsugu in the Uesugi army acting as Kenshin's retainers, and similarly the Takeda army gains Yamamoto Kansuke as a strategist to work alongside retainer Oyamada Nobushige. Incorporating additional warriors with speaking parts and unique costumes of their own makes the scale of the conflict seem much grander, and that's not the only way the creators have chosen to give the audience a sense of Takeda Shingen's importance - the townspeople of Kai appear several times to praise their protectors in song. This is where another original character, Kosuke, comes into play. He's a young boy who yearns to become strong, inspired by Yukimura's prowess in battle and the way he treats the common people. Not far from Kosuke's side is Inori, the pretty young girl dressed in yellow who appears in the promotional posters. She's an original character whose importance is established right from the first scene when Yukimura heroically rescues her from certain death. Over the course of the story we learn that Inori has developed feelings for the young warrior, worrying about him whenever he heads out to battle and trying to support him in her own way. Yet while Yukimura seems to enjoy her company, he makes no secret of the fact that he has eyes for nobody other than his beloved Oyakata-sama. The reasons behind Yukimura's single-minded devotion to his lord are explored in a flashback to his past, which is interesting even though it has little to do with actual history or established Sengoku Basara canon. Yukimura's father, Sanada Masayuki, is shown to be surprisingly similar to the young tiger; an honourable man who shouted passionately at Shingen in the same way his son would come to later on. While at first Yukimura blames Shingen for the wars which led to his father's death, his anger soon turned to a kind of respect as the pair share their first ever punching match. Shifting back to the 'present', Yukimura reveals that he's been having strange dreams recently which leave him feeling anxious about the future of the Takeda army. The last of the original characters created for this musical, Yume, appears in these dream sequences as a beautiful dancing woman. The second act takes a much more serious turn with Shingen passing command of the Takeda forces to Yukimura after being severely injured in the battle. Yukimura's nightmares intensify after taking on this new responsibility and, just like in Sengoku Basara 3, he begins to fall apart as he's consumed by self-doubt. Inori initially tries her best to keep cheering for an increasingly-distant Yukimura. However, when she's alone we're shown that she has been communicating with an unknown man who sternly reminds her of her ties to him. It seems that the sweet Inori is actually an enemy ninja working for the Oda army, and she's been reporting the movements of the Takeda and Uesugi forces directly to Akechi Mitsuhide! Sasuke confronts Inori, and eventually Yukimura learns that she is partly responsible for Shingen's injuries. Torn between her duty and her emotions, Inori sacrifices herself in battle and it's up to Kenshin to give Yukimura the guidance he sorely needs in order to lead the Takeda forces. The finale of the show has Yukimura appearing once more, this time clad in Shingen's imposing armour and wielding upgraded spears. Both Kenshin and Masamune are forced to acknowledge his power after they've all crossed blades, and Oyakata-sama is visibly proud when he returns to the stage. The bittersweet story wraps up with the same pride and dignity with which it began as a traditional Japanese dance accompanied by instrumental music ends the show. Ranju Tomu's Yukimura is strong and gallant, at times appearing closer to how the real-life warrior is often portrayed than the melodramatic Sengoku Basara version. Part of this is because we are offered a rare glimpse of how Yukimura appears to the common people of Kai who rely on his protection and look up to him. The other stand-out performance for me was, surprisingly, Nozomi Fuuto as Sasuke. Of all of the roles in the story I'd have imagined that Sasuke would be one of the hardest for a woman to play - yet Nozomi did such a marvellous job that I was blown away every time she appeared. Sasuke's ability to switch between being Yukimura's jovial retainer and a cold-blooded ninja whenever necessary came across beautifully. The range of Nozomi's voice was also exceptional. Of course, the one role which was practically written for the Takarazuka Revue from the start was that of Uesugi Kenshin and he gets a much more significant part in the story than he has had in the recent games. Kasuga has several opportunities to fall into Kenshin's arms adoringly as well as a pivotal role in the show's best battle scene. Date Masamune's part is relatively small given his prominence in the series. He fights with Yukimura as equals, then scorns him for being weak. It's only right at the end that Masamune seems ready to accept Yukimura as a worthy adversary once again. The audience chuckled with delight when Harukaze spoke Masamune's trademark ridiculous English and the choreographers did an excellent job when it was time for him to use his six swords. I'm not going to go through every character individually, so I'll just finish by saying that every performer was perfect. The women were beautiful, the men were heroic, and every single Takarasienne performed with such professionalism and grace that it was impossible to look away from the screen for a moment while they were on stage. There are a handful of on-disc extras included on this DVD as a special treat. The first is a compilation of scenes showing the actresses training out of costume. Since I'm not familiar with any of the cast members it was interesting to see them all close up without the theatrical makeup (the otokoyaku actresses were just as cool and manly backstage). The second extra is the 'screen footage' from the play; the special effects played during battle presented without the distracting action taking place on the stage in front. Lastly, there's a batch of special messages from the cast recorded on the final night of the musical's run. With this being a musical adaptation it would be remiss of me not to mention the songs which repeat several main themes throughout the course of the show, all of which are catchy and easy to remember later on. The melodies often incorporate familiar music from the game, most noticeably in the case of Yukimura's theme which crops up several times. The singing is clear enough to make it very easy to follow the lyrics. I've only seen one Takarazuka performance before (Soragumi's Valencia No Atsui Hana/Sora Fantasista way back in 2007) and it was staged in a much simpler, more traditional way. I'm not sure whether this is standard for the Revue nowadays but the special effects in Sengoku Basara -Sanada Yukimura-hen- were very advanced, using a complex arrangement of screens and projections to show the characters' special moves in their full over-the-top glory. It reminded me strongly of the Tiger & Bunny The Live stage show I went to see last summer. Indeed, the large cast and ambitious staging contributed to the luxurious feel of the musical. In contrast, the Butai Sengoku Basara stage play series is much simpler, rougher and full of shouting and the costumes are less elaborate, needing to be robust enough to stay in place during the intense combat sequences. The Takarazuka musical puts more emphasis on the emotional story and characterisation, and the costumes have been heavily stylised to make them more glamourous and suitable for a female cast. The differences between the two styles of performance is fascinating to see as a fan of the subject material; I feel very lucky to have had the opportunity to watch both. 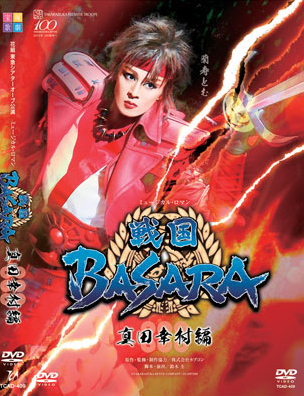 In summary, as a Sengoku Basara fan I found the Sengoku Basara -Sanada Yukimura-hen- musical thoroughly enjoyable. The inclusion of scenes we've never seen covered by the actual Sengoku Basara games was a particular highlight. I wonder how the dedicated Takarazuka fans in the audience felt about this adaptation? My review doesn't include any screenshots, however there are plenty available online from Famitsu's preview images to a multitude of photo reports published during the musical's run via Famitsu, Mantan Web, Crank-In, MyNavi, 4Gamer, Living, Otakuma, Gamer, TV Life and Takarazuka Journal. Aside from the mook and soundtrack, I also covered some of the merchandise released for the musical here. I saw a video of this online, of like the first... two minutes or so? Glad you have a review! Thank you for the comment! I hope you can get a copy soon (even though it has made it hard to listen to Yukimura's theme without imagining a chorus joining in and singing along, haha).